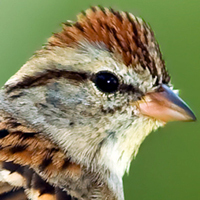 Would it surprise you to know there are over 30 species of sparrows in North America? Sparrows may be brownish for the most part, but they have some beautiful and unique songs, and many have distinctive markings that make them easy to identify. The moniker LBB (little brown bird) doesn’t really do them justice. Learning how to identify even a few sparrows can be simple and a lot of fun! Let’s take a look, and a listen, to a few of the more common and easy to identify sparrows. 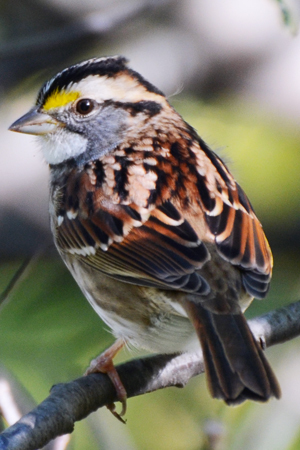 Here’s a really simple one….the White-throated sparrow. It has, not surprisingly, a white throat. During breeding season, look for bright yellow spots by the eyes (the “lores”), and listen for “Oh Canada, Canada, Canada” Well, he doesn’t say exactly that, but pretty close, and no other bird sounds anything like it. So even if you do n’t get it right visually, the song is a slam dunk. Song Sparrows have a beautiful, loud and amazing song. Right now they are singing from dawn until dusk in open areas. 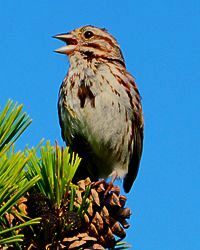 You can visually confirm the identification of their song if you see a sparrow with a streaky breast — many have a dark blotch in the middle. A little reddish-brown cap and black line through the eye is the first indication it may be a Chipping sparrow. But, there are a few other sparrows who have a little reddish cap…so listen for the song! Did you know this beautiful bird, the Eastern towhee, is a sparrow? This is a huge sparrow that isn’t just a little brown bird. Check him out – he’s our bird of the month – and he has a very distinctive call. Sparrows may not have terribly flashy plumage, but their vibrant songs and energetic activities make them a fun group of birds to learn to ID. Next time you see a sparrow, take a moment to listen as well as look. Sparrows – They’re Not Just Little Brown Birds!